The view from the skybox. Pinch yourself, you’re not dreaming. 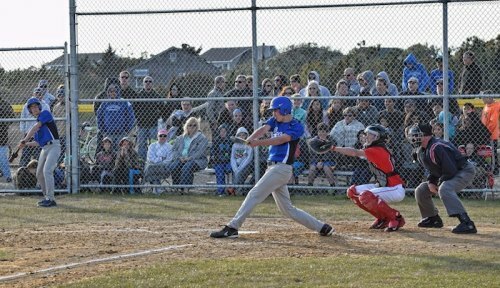 That really is baseball on Ocracoke! Over 200 people came out to the first ever home baseball game on the brand new ball field at the brand new Ocracoke Community Park. That’s a pretty good percentage of our little island’s population. What if 20% of the residents of New York City came out for a Yankees game? There’d be no room for all of them in the bleachers. That’s what happened on Ocracoke, too! 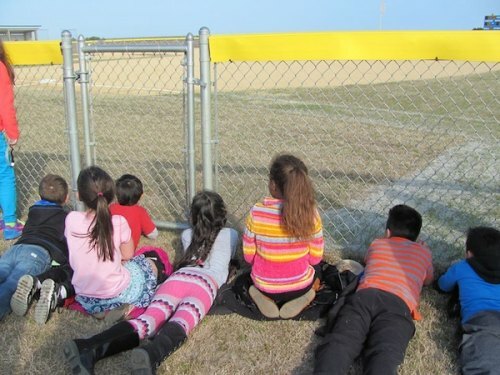 It was standing room only at the baseball game, but the happy fans lining up along the fence didn’t mind at all. 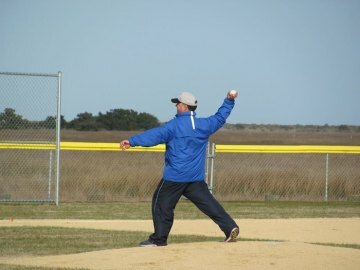 Vince O’Neal, head coach of the high school baseball team and president of the Ocracoke Youth Center, which owns the new park, was chosen to throw out the first pitch. Vince was the obvious choice, but it was still a surprise to him. “They didn’t tell me ahead of time – they snuck up on me,” he said. “It was all fun.” He’s looking forward to all the other firsts when the middle school, Blue Claws (ages 7-9), Raptors (ages 10-12), and T-ball teams (ages 4-8) get a chance to play. There’s also talk of an adult softball league this summer. Vince was happy with the turnout for the first game. Vince throws out the first pitch. All the spectators I talked to were also having the same great feelings – a combination of disbelief and joy. “It’s amazing,” said Charles Temple, who is Ocracoke School’s high school English teacher and athletic director. He was running the scoreboard from the deck of the press box. “I keep having to check where I am. It doesn’t seem like Ocracoke until you look out and see the marsh ­– and then feel the wind." “I never thought we’d see so many people,” said OYC board member Brian Samick, clearly impressed with the fans who braved chilly winds to be there. “How fitting that the first game is against Hatteras. It’s just perfect.” Until this great moment, Ocracoke’s “home” games had always been played on Hatteras Island fields. Now we get to host our opponents here. Speaking of Hatteras… OYC board member Bob Toth was out to the field early on game day, and the first people to arrive were the Hatteras team. As they walked across the bridge, they were looking around and saying things like, "This is awesome!" “It's a nice testament to the ballpark when visiting teams compliment it,” said Bob’s wife Ruth. 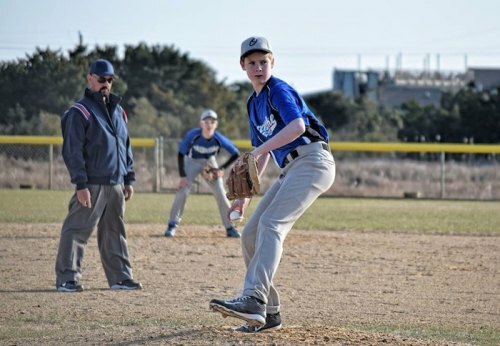 One baseball fan was experiencing his first trip to Ocracoke, and enjoyed being witness to an historic event. Visiting author Charlie Lovett (he was the guy at the game that you didn’t know) was on the island to speak at the annual Friends of the Library meeting. He'd also talked with the middle and high school students at Ocracoke School earlier in the day. Middle school baseball coach Bill Cole watched the beginning of the game from the roof of Howard’s Pub before he got off work and headed over to the field. He just missed being the first coach to host a home game – the middle school team was supposed to play Monday, but the game was cancelled due to – you guessed it – weather. “It’s awesome to see kids playing out there,” he said. “It’s been a long wait, with a lot of community effort. And it will be great for everyone – the Blue Claws, the Raptors, T-ball, soccer.” Bill is an all-around sports fan. Stating that a high school sports program “is only as good as your feeder program,” Padgett said that having the field “gives kids an opportunity to get more exposure – that’s the way you get better and it’s going to strengthen our teams in the future.” He’s also excited about the possibility of adding soccer to the roster of Ocracoke School sports. The view from the home team dugout as Samantha Styron sings the National Anthem. 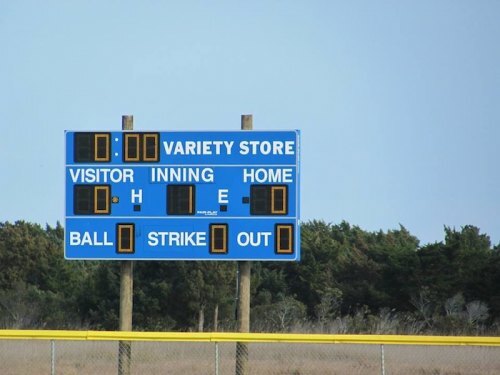 The Ocracoke Youth Center board (currently Vince O’Neal, David Scott Esham, Bob Chestnut, Garick Kalna, Brian Samick, Barbara Jemison, Greg Honeycutt, Bob Toth, and John Giagu) have been working for three years to build this field of dreams. Their efforts have been supported by grass roots organizing and fundraising, including the Ocracoke 5K/10K race and a golf cart raffle ($19,230! ), and generous grants from Ocracoke’s occupancy tax board and the Outer Banks Community Foundation. The Burrus family that sold them the property is owner-financing it; without their cooperation, it never could’ve happened. Darren Burrus has donated about $100,000 worth of labor to get the field built, Vince said. Other fundraisers are planned for the fall. Two visiting teams will be spending the night on Ocracoke next month, showing that our occupancy tax is already getting a return on their investment. 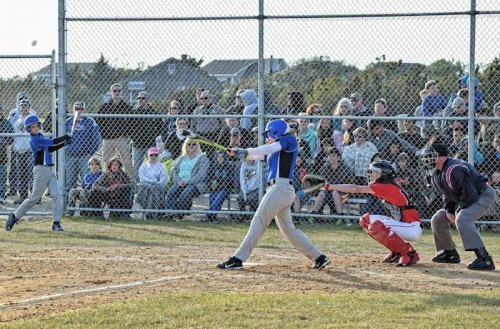 Coming soon to the Ocracoke Community Park: filling in the sandy area behind the bleachers with gravel, building two batting cages, installing permanent and roomier bleachers with handicapped seating, adding a flag pole, and opening a concessions stand. Eventually, there will be nature trails around the perimeter of the park that connect with trails at the bordering NPS and NC Coastal Land Trust properties. As Tuesday’s game went into its 7th and final inning, the sun was setting and dusk was settling in. Although lights on the field would increase potential playing time, Vince said that’s another phase for the future, with no timeline for that right now. The seeds for a ball field had been planted decades earlier by other community-minded people, but their plans had always been thwarted. Ocracoke School teacher Leslie Cole summed up the community’s can-do spirit. “Everybody who bought a raffle ticket, everybody who ran in the race, or participated in all the fundraisers over the years – do you see the smiles on the kids’ faces? You did that! That’s awesome!” she said with her usual enthusiasm. Our home team is comprised of two girls (Josie Winstead and Brieanna Boos – yay, Title IX!) and eight boys (Liam Caswell, Darvin Contreras, Spencer Gaskins, Macky Kalna, Carson O'Neal, Eldon Robinson, Dylan Sutton, and Waylon Underwood). Liam pitched, and Josie was the first Dolphin across the plate. The final score was a 13-6 win for the Hurricanes. But the Dolphins and their fans felt like the real winners when they gazed in amazement at their beautiful ball field. For a history of the Field of Dreams, check out this old article on the Current! Check the Current calendar to find out when the next home games are! Thanks for the scoreboard, Variety Store! If you build it, they will come. It just seems right to cross a bridge to the Ocracoke ballfield.